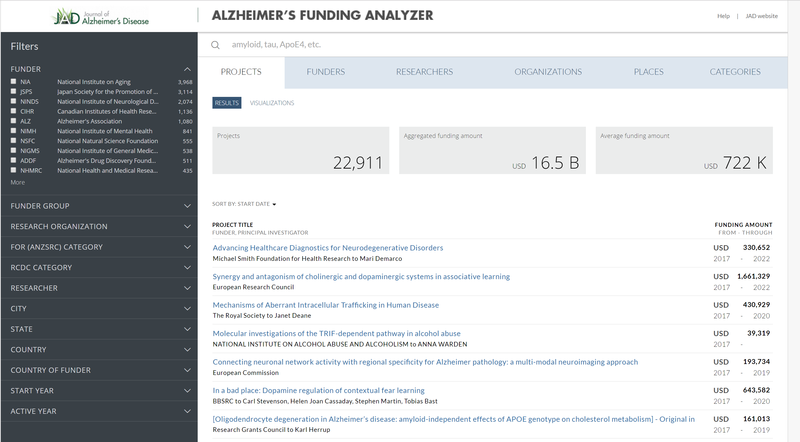 The Journal of Alzheimer’s Disease (JAD) is pleased to announce that its Alzheimer’s Funding Analyzer (AFA) now includes all Alzheimer’s Association (AA) grants in addition to grants from other funding bodies. AFA is a free service that is part of a suite of online features integrated into the JAD site to meet the needs of the Alzheimer disease (AD) research community. Caption: JAD’s Alzheimer’s Funding Analyzer showing results for a search of Alzheimer’s Association grants. There are currently 1,080 Alzheimer’s Association grants represented on the site with an aggregated funding amount of $189.5 million and average funding amount of $175,000. Top institutions by total funding amount receiving Alzheimer’s Association grants include New York University; Case Western Reserve University; Icahn School of Medicine at Mount Sinai; Columbia University Medical Center; Massachusetts General Hospital; and the University of California, San Diego. AFA empowers the AD community to track all organizations currently funding AD research around the globe. It consolidates in-depth data on 167 funders from 54 countries including the United States, Canada, United Kingdom, European Union, Ireland, Australia, and Qatar. It is comprised of close to 22,000 Alzheimer grants representing $16.5 billion in Alzheimer-related research. New funding information is continuously added to AFA. The top five funders are the National Institute on Aging, National Institute of Neurological Disorders and Stroke, National Institute of Mental Health (USA), Medical Research Council (UK), and European Commission. AFA enables users to easily locate funding related to AD and analyze funding streams and trends. Further, it facilitates a better understanding of research organizations’ funding portfolios and the funding patterns of specific funders, both of which are critical when developing grant applications. For example, users can conduct line-of-investigation queries (e.g., tau, ApoE4, vaccine) to look for funding trends and determine which investigators in which countries have been the most successful in obtaining funding in a specific area of AD research. “Now expanded with inclusion of AA grants, we are very excited to provide this comprehensive listing of the funding that has made progress possible, which can be studied to understand how Alzheimer’s disease research is developing,” commented JAD’s Editor-in-Chief George Perry, PhD, Dean and Professor of Biology, The University of Texas at San Antonio. Working with development partner ÜberResearch, a solutions and services company focused on the needs of science funders, AFA includes all funding related to AD drawn from ÜberResearch’s extensive grant database of more than $1.1 trillion of funded research, representing more than 3.4 million projects from 258 different funders like the National Institutes of Health and the National Science Foundation in the U.S. and the Wellcome Trust and U.K. Research Councils in the U.K.
“ÜberResearch is honored to collaborate with our friends at JAD and the Alzheimer’s research community. We hope to provide more information on global funding, support better research decisions, and expedite the development of treatments and the search for a cure,” said Christian Herzog, CEO of ÜberResearch. Free registration on JAD not only enbles users to access AFA, but also to use other features on the site. The Journal of Alzheimer’s Disease (www.j-alz.com) is an international multidisciplinary journal to facilitate progress in understanding the etiology, pathogenesis, epidemiology, genetics, behavior, treatment, and psychology of Alzheimer’s disease. The journal publishes research reports, reviews, short communications, book reviews, and letters-to-the-editor. Groundbreaking research that has appeared in the journal includes novel therapeutic targets, mechanisms of disease, and clinical trial outcomes. The Journal of Alzheimer’s Disease has an Impact Factor of 3.920 according to Thomson Reuters’ 2016 Journal Citation Reports®. JAD is published by IOS Press. Commencing its publishing activities in 1987, IOS Press (www.iospress.com) is headquartered in Amsterdam with satellite offices in the USA, Germany, India, and China and serves the information needs of scientific and medical communities worldwide. IOS Press now publishes over 100 international journals and about 75 book titles each year on subjects ranging from computer sciences and mathematics to medicine and the natural sciences. ÜberResearch is a leading provider of software solutions focused on helping funding organizations, non-profits, and governmental institutions make more informed decisions about science funding. The company’s cloud-based platform provides better views of an organization’s grant data, peer organization activities, and the data of the funding community at large. The software functions span search and duplication detection to robust tools for reviewer identification and portfolio analysis. ÜberResearch is a global business with main offices in Cologne, Germany; London, United Kingdom; Washington DC and Columbia, USA, and other European and US locations. ÜberResearch is a portfolio company of Digital Science. For more information, visit: www.uberresearch.com and follow @uberresearch on Twitter.